BROOKLYN — Through a friend of a friend, David Abramovich found a sunny room in a five-bedroom apartment in an industrial building near the Barclays Center when he relocated here from San Francisco this summer for his job at crowdfunding start-up Indiegogo. The 33-year-old tech worker pays $895 a month. That's nearly 60 percent less than the average price for a Brooklyn studio, according to real estate firm MNS. Altogether the Prospect Heights home has six roommates, a steady stream of guests crashing on the couch and the occasional small concert staged in the living room of the fourth floor walk-up that still has manufacturing companies on lower floors. "A lot of people don't want to have five roommates, especially in their late 20s and early 30s, and once in a while, it's like, 'Yo, there are a lot of dishes in the sink,'" Abramovich said. "But it turns out I like to live with a lot of people. And price is important to me." Some developers are now trying to create their own versions of these types of housing set-ups — albeit up-to-code (which Abramovich's apartment is not) — with sleeker amenities and even social directors like on cruise ships. Recognizing the thriving underground housing market for single young professionals, whether out of college for a year or even a decade, who subdivide apartments — sometimes illegally — companies are eyeing a model based on "micro-suites," where up to three tenants, each with their own small room, share a kitchen and bathroom. Each tenant will be on the lease — something that is rare in the underground housing market. Having only one or two tenants on a lease can be problematic if there are problems with the apartment but is a boon for those who don't have credit scores needed to rent their own apartments. "Something way bigger is going on here and the market hasn't stepped up to find a solution," said Christopher Bledsoe, of the start-up Stage 3 Properties, named for the stage in life sociologists now call "emerging adulthood." "There's been a seismic social shift," Bledsoe said of 20-somethings, who are no longer getting married and fleeing to nest in the suburbs at the age of 22, as was the median age in 1970. Stage 3 recently teamed up with Simon Baron Development Group, to focus on this market of recent grads, and plans to launch its first of several New York projects this spring, converting apartments into 10 three-bedroom micro-suites for 30 tenants in a 200-unit Manhattan building. Each tenant in a shared suite would have, on average, 250 square feet, Bledsoe said. 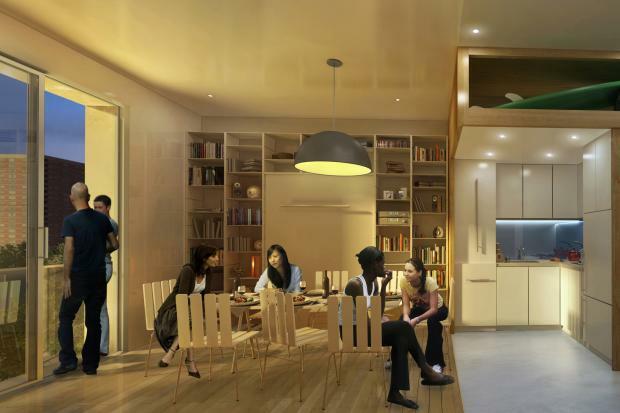 It plans to break ground next month for a 90,000-square-foont new development, at an undisclosed Queens location, for micro-suites housing 350 renters. The suite model helps get around certain city codes, which make it hard to build apartments less than 400 square feet and prohibit more than three unrelated adults from sharing one unit. The company is not only planning to help roommates find each other using an algorithm similar to dating sites, it will also hire social directors, who will help tenants plan activities like ski trips to Hunter Mountain, Bledsoe said. The suites will be pre-furnished with "space-saving systems," offer a weekly housekeeping service that's included in the rent and will have hotel-like amenities like rooftop pools, gyms and WiFi, he added. "For us, the goal is to provide a higher quality of life and better tenant experience at price points competitive at the upper reaches of underground market," said Bledsoe. He has extensively researched Craigslist ads to gauge pricing and the types of offerings, like the $350/a month room in San Francisco for "a very, very open minded female," under the age of 35 to share a bedroom and queen-sized bed with a male "though not necessarily in an intimate way. "We're bringing a product from the shadows of market into the light of day," he added. Bledsoe anticipates charging tenants in micro-suites roughly 30 percent less than a studio in the same neighborhood with similar amenities — which means they are eyeing hot locations where studios tend to be slightly cheaper, like the far west and east side of Manhattan, Harlem, Queens and industrial parts of Brooklyn, Bledsoe noted. "If a conventional studio is $2,500 a month, but a micro-studio is $2,000, instead of earning $100,000 a year, you need to earn $80,000 [since landlords require you earn 40 times the monthly rent]," Bledsoe said. "But there's still a whole segment that doesn't earn $80,000." With the traditional model of affordable housing, which depends on government subsidies, it's hard for developers to reach middle income New Yorkers just out of range of qualifying for the units, Oriwol said, but there's clearly a need to reach these tenants who are "converting stuff on their own," and may be at the mercy of a roommate on the lease, who may be charging them a lot more for their share of the home. "I know a ton of people in their late 20's who subdivide apartments, who pay rent every month and have no connection to their landlords," Oriwol said. "It gets messy." But, he added, "There are a lot of people are looking for another way to live and not break the bank." The median household income for New York's one-person households in 2013 was $32,615, according to census data, noted Moses Gates, with the advocacy group Association for Neighborhood & Housing Development. That equates to an $815 rent being affordable. And recent grads aren't the only types of singles in need of affordable housing, he added. More than half of the city's one-person households are over the age of 55.